Well, that worked pretty well until 1511, when Portuguese sailors ventured beyond India, making it all the way to Indonesia and the Moluccas, or Spice Islands. Sure, India had ginger, black pepper, cardamom, and cinnamon, but the Spice Islands had nutmeg and cloves, and no one else did. This meant that Portugal now had a lock on the spice trade. It was not long before the question was raised in Spain of just how far east Portugal could go before it was straying into Spain’s territory. Surely, the Line of Demarcation separating the two country’s claims must continue on the far side of the globe. Maybe Spain could claim the Moluccas. Ferdinand Magellan, a Portuguese navigator, trader, and soldier of considerable skill and experience, had done an immense amount of service for the King of Portugal. After being wounded in a battle that he had been sent to in lieu of a response to an earlier request, Magellan asked for a small raise, to compensate for the limitations created by his injury. The King of Portugal told him he should find work elsewhere. Magellan wanted get even with the King of Portugal, and the best place to do that was Spain. He explained that he could prove that the Moluccas were too far east to still be considered Portuguese, and the King of Spain was only too happy to outfit him with ships and provisions. Magellan survived storms, mutiny (Spanish sailors weren’t crazy about having a Portuguese captain), hardship, and hunger. He discovered the straits that were later named for him and successfully navigated the Pacific Ocean. Unfortunately, he didn’t survive the Philippines, where, though the first people he met were eager to associate with the newcomers, a tribe he met later was not so eager to befriend strangers. Because Magellan had both conceived the idea of the trip and successfully navigated all the parts of it that no European had ever seen before, the circling of the globe was attributed to him, even though the rest of the circumnavigation was done without him. The handful of men aboard the one ship that made it back to Spain were handsomely rewarded, however, even though the feat did not give Spain access to cloves. Cloves are the unopened flower buds of a tree in the myrtle family. Cloves are so fragrant that it is said that ships’ crews could smell them as they approached the islands where they grew. The English name comes from the French clou, which means “nail,” referring to the appearance of a whole, dried clove. Because they came from even farther away than India, from a place with no land routes to the world’s markets, cloves reached Europe rather later than most other spices. They made their first appearance in the West in 335 A.D. (though they had been known in China for at least 500 years at this point.) They were presented to the Emperor Constantine by Arab traders specializing in delicacies from Asia. However, where cloves came from remained a mystery, and when the Roman Empire collapsed, cloves disappeared from Europe for nearly a thousand years. When Saracens began to invade Europe and Europeans started to fight Saracens, cloves resurfaced. 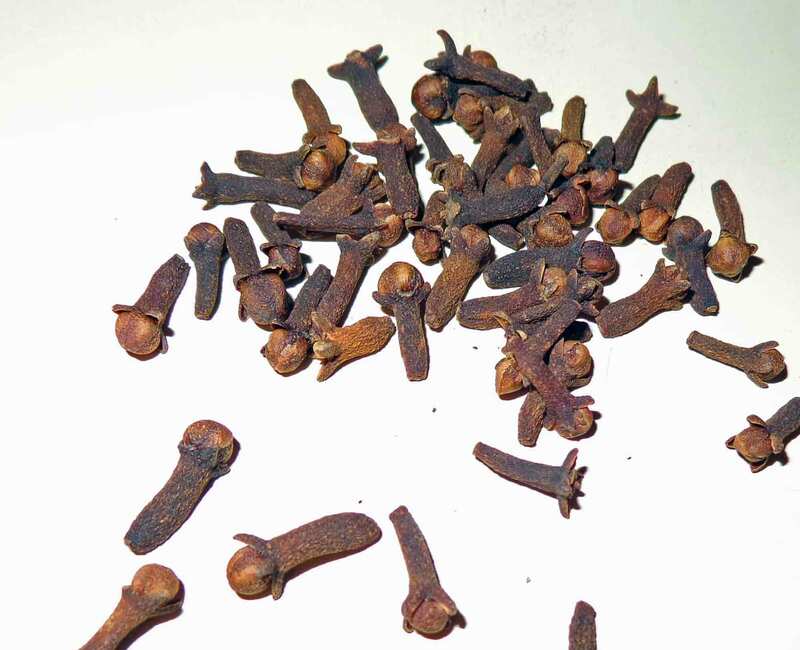 By 1228, cloves were listed among dutiable imports in both Marseilles and Barcelona, so they had clearly made a comeback. But Europeans still did not know where the Arab traders were getting their cloves. That changed, of course, when the Portuguese found the Moluccas. Portugal actually tried to keep this discovery a secret and published false maps of the region. However, suddenly become the world’s major source of a costly spice is kind of hard to keep under wraps—hence the voyage of Magellan on behalf of the Spanish. The Spanish were followed by the English. In 1577, Sir Francis Drake began his famous global circumnavigation in the Golden Hind, and returned to England in 1580 with his ship heavily laden with cloves. But Portugal still controlled the trade—until the Dutch got into the act. When the Dutch showed up in 1605, they not only got rid of the Portuguese, they even destroyed most of the clove trees, sparing only those on a couple of easily defended islands. The Dutch also issued their own fake maps, again, to try to keep everyone away. The Dutch raked in the money for a couple hundred years, but by the end of the 1700s, competition was increasing. A Frenchman named Pierre Poivre had succeeded in wresting a few clove seedlings from the Moluccas and transplanting them elsewhere, including Seychelles, Reunion, Zanzibar, and Mauritius. An avid horticulturalist with a surprisingly modern attitude about preventing deforestation, Poivre was appointed administrator of Mauritius in 1765. However, his enemies, wanting him to fail at what would be a massively lucrative operation should it succeed, sabotaged Poivre’s trees. Only one survived, but that one tree was to give rise to nearly all the commercially grown clove trees in the world today. Sadly, the Moluccas faded from the scene, as so few trees survived Dutch occupation. Zanzibar and Mozambique now rule the clove trade, though cloves also grow in Brazil and Sri Lanka. Cloves remain a costly commodity, because they are so labor intensive. Every bud has to be picked by hand at precisely the right moment, and every tree has to be gone over day after day, as buds emerge. But they are intensely fragrant and flavorful, so they go a long way. Thanks. It’s always fun to know that someone is reading my posts — and particularly gratifying when they’re enjoyed.